Our selection from the Most Popular charity raffles in Australia, all listed in draw date order. Every prize must be won in Every raffle, Good Luck! MS Queensland Limited Edition Art Union - supports people suffering from Multiple Sclerosis, a condition affecting areas of the body's central nervous system. MS Limited Edition Art Union is a proud supporter of RaffleResults.com.au. Raffles On Sale - MORE THAN $17 MILLION IN FIRST PRIZES TO BE WON! - Give Someone an exciting surprise - Buy a Raffle, Lottery or Art Union Ticket to mark a Special Occasion. Scroll down the page and match up one of the dates with someone's birthday. Not only will you be giving them an exciting present and a chance to win a great prize - you will be helping a worthwhile cause! Cerebral Palsy Alliance works to enhance the lives of people with cerebral palsy and enable their full participation in the community. yourtown helps disadvantaged young people establish their place in life through training, counseling and other support services. Prize Home Draw # 486: Valued at $1,695,293 - Bilinga (Gold Coast), Queensland + $350,000 Gold Bullion or Newtown (Sydney), NSW. Mater Prize Home - your support helps provide patient care and research at Mater. Mater Prize Home Lottery # 282: Win a $1.87 million Gold Coast haven. Gold Choice Art Union : Supporting Sporting Wheelies & Disabled Association - enhancing the lives of people with a disability through community engagement and education, sport and healthy activity. Endeavour Foundation Lotteries: Supporting more than 3,300 people with a disability in more than 230 locations: Lottery # 421, Montville, Sunshine Coast Hinterland, Queensland, valued at $1.3 million. Mater Cars for Cancer # 86: Driving cancer research at Mater, giving fuel to a brighter future. Mustang Bullitt + Triumph Bonneville + $100,000 Cash. Royal Life Saving WA - residents of WA only. The Epilepsy Centre SA & NT: Improving in all respects the welfare of people living with epilepsy and their families in South Australia and the Northern Territory. Act for kids: Providing free professional therapy and support services to prevent and treat child abuse and neglect. The Sports & Charity Raffle. Endeavour Foundation Ultimate Life Changer Lottery. Rotary Club of Melbourne Inc: Helping to immunise 100,000 childred across nine Pacific countries. Multiple Sclerosis Limited: Supporting people suffering from Multiple Sclerosis, a condition affecting areas of the bodies central nervous system. MS Dream Home Lottery: $2,600,000 Porter Davis Home & Land Package or $2,600,000 in Gold. Which dream Victoria suburm would you build in? RSPCA National Lottery helps care for over 120,000 animals that come through their doors each year. Help them to help our furry friends and buy a ticket today. You could win part of $20,000 in prizes. RSPCA supporters living in WA should consider the Weekly Lottery shown below. CHARITY / ISSUER & DATE DRAWN PRIZES ON OFFER - Luxury Homes, Motor Vehicles, Travel, Precious Metals and Cash...and more! CONTACT / HOW TO ORDER - CLICK ON IMAGES / LINKS PROVIDED. Just one $15 ticket allows you to participate in 5 draws each month. 1 x Prize of $1,000. 4 x Prizes of $500. 50 x Prizes of $50. Jackpot Draw: Twice every year (June and December) the last prize of the month becomes $5,000. Please note this raffle is only open to WA residents. 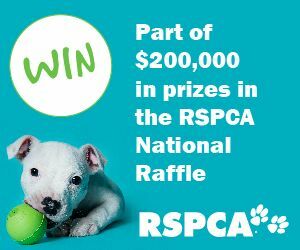 Non WA residents should enter the RSPCA National Raffle. RSPCA is the oldest, largest and leading animal welfare organization in Australia. Tickets start @ $2 each - purchase for at least 4 weeks. Lucky Winners: Receive $1,000 Cash Prize each fortnight. Join Royalty VIP Club starting @ $10 per month. 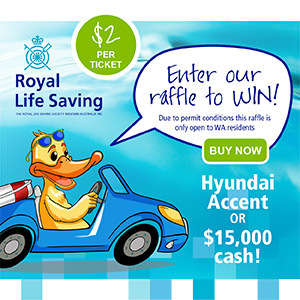 - 3 major raffles with the chance to WIN a brand new Hyundai or $15,000 Cash. - 9 x VIP Raffles with the chance to WIN $10,000 Cash or a $10,000 Travel Voucher. - 9 x Loyalty Reward raffles with the chance to WIN Tablets and LCD TV's. Over $130,000 in prizes to be won each year. Please note this raffle is only open to WA residents. House with No Steps # 40. Tickets start @ 6 for $30. Cerebral Palsy Alliance # 112. Tickets start @ 3 for $15. 1st Prize: $20,000 Cash or Brand New Toyota Corolla Ascent valued at $26,438. Bonus Draws: Join up as an Alliance Plus member and be eligible to win $1,000 each week. Plus, 15 VIP members will each win 500 bonus tickets. Online Buyers Draw: Purchase tickets online for chance to win a $500 Coles Myer Gift Card. 1st Prize: $10,000 Coles Group & Myer Gift Card. 2nd Prize: $2,500 Coles Group & Myer Gift Card. 3rd Prize: Peninsula Hot Springs Bliss Pamper Pack $1,166.. Early Bird Prize: Drawn 2.4.19, $500 Coles Group & Myer Gift Card. yourtown Prize Car Draw # 1113. 100,000 tickets @ $10 each. 1st Prize: Maserati Levante plus $10,000 Gold Bullion and $5,000 Flight Centre Voucher or $200,000 Gold Bullion. 1st Prize: 26 Riviera Place, Mountain Creek, Queensland 4557, valued at $1.2 million. Endeavour Foundation Ultimate Life Changer Lottery # 825. 1st Prize: Beneteau Oceanis 31 Yacht plus Audi RS 5 Coupe plus Gold, or BMW M5 Sedan plus BMW X5 SUV plus Gold or $500,000 Gold Bullion. Play for Purpose The Sports & Charity Raffle # 3. 250,000 tickets @ $10 each. 1st Prize: Valued at $250,000 - choose your own 1st prize from one of 3 options including $250,000 Cashable Gold. 2nd Prize: $50,000 Travel Voucher. 3rd Prize: Singaore F1 Grand Prix 2019 Experience $20,000. 4th Prize: $10,000 Travel Voucher. 4th Prize: $5,000 Travel Voucher. 7,520 additional prizes to be won totalling $165,000. Guide Dogs Queensland Lottery # 151. 15,000 tickets @ $20 each. 1st Prize: Hyundai Tucson Go 2.OP or $30,000 Gold Bullion. 2nd Prize: $10,000 Gold Bullion. 3rd Prize: $5,000 Gold Bullion. Consolation Prizes: 300 x $50 Coles Group & Myer Gift Cards. Bonus Gold Paw Draw Prize: $2,000 Coles Group & Myer Gift Card. Cancer Council WA Hope More Lottery. 50,000 tickets @ $100 each. Olivia Newton-John Cancer Wellness & Research Centre Raffle # 1901. 575,000 tickets @ $2 each. 1st Prize: Honda CR-V 2 WD VTI Auto o.r.c $34,589 or $30,000 Gold Bullion. 2nd Prize: Coles Group Shopping Voucher $1,000. Book Sellers Prize: Coles Group Shopping Voucher $500. VIP Club Prize: Coles Group Shopping Voucher $500. Two Early Bird Sellers Prizes: $1,000 Coles Group Shopping Vouchers. drawn 22.3.19 and 12.4.19. Access Industries Art Union # 211. 1st Prize: Subaru Impreza MY 18 Hatch $25,190. 2nd Prize: Travel Credit $10,000. 3rd Prize: Harvey Norman Gift Catd $4,000. Epilepsy Centre SA & NT Adventure Awaits You Lottery. 5,500 tickets @ $60 each. 6 x Prizes: $500 Cash each. 12 x Prizes $250 Cash each. Mater Cars for Cancer Lottery # 86. 1st Prize: Mustang Bullitt + Triumph Bonneville T120 Black + $100,000 Cash. Total 1st Prize Value $208,925. Sporting Wheelis & Disabled Association God Choice Lottery # 320. Tickets start @ 3 for $6. 3rd - 12th Prizes: $500 Cash. Online Ticket Purchase Prize: $500 Woolworths WISH card. Weekly VIP bonus draw: 4 x $500 Woolworths WISH cards to be won. Act for Kids Victoria Raffle # 6. 1st Prize: Two 1st Prize Winners can choose between $10,000 Gold Bullion or a $10,000 Travel Voucher. RSL Art Union # 365. 1st Prize: $3.3 million Property Portfolio - Melbourne, Sydney & Noosa. Alannah and Madeline Foundation Raffle # 9. 1st Prize: Two 1st Prize Winners can choose between $10,000 Gold Bullion and a $10,000 Travel Voucher. MS Limited Edition Art Union # 198. 8,500 tickets @ $50 each. 1st Prize: Mercedes-Benz AMG GLC 63 S Coupe, $189,704 drive away. Multiple Ticket Bonus Prize: Mykonos Holiday valued at up to $17,100. 5 nights for 2 people. Autobuy Prize: Hayman Island Holiday $9,170. 4 nights for 2 people. Rotary Club of Melbourne Inc.
10,000 tickets @ $10 each. 1st Prize: All-inclusive 15-day River Cruise from Amsterdam to Budapest on the MS Royal Emerald for 2 adults. Return economy airfares included. Value up to $20,000. 2nd Prize: 8 nights at the acclaimed Grand Hyatt in Bali for 2 adults & 2 kids (under 12). Value up to $8,780. 3rd Prize: 8 nights at the 5 star JW Marriot Khao Lak, Thailand, including airfares. 2 Adults + 2 kids (under 11). Value up to $7,000. 4th Prize: 5 nights at the iconic Seaworld Resort on the Gold Coast. 2 Adults + 2 kids (under 12). Value up to $2,000. 5th Prize: $500 Luxury Escapes Voucher. 6th Prize: $250 Luxury Escapes Voucher. Ticket Sellers Draw: (20+ tickets) $250 Luxury Escapes Voucher. The Deaf Lottery Australia # 178. 1st Prize: Valued at $700,000 - Four 1st Prize Options: Mortgage Buster, Investment or Lifestyle, Getaway Lifestyle, Design your own Lifestyle. Mortgage Buster option includes $650,000 Gold Bullion and $20,000 Cash. All other options also include Gold Bullion and Cash. Investment of Lifestyle option includes a Home and Land package with Metricon Homes. 2nd Prize: $5,000 Gift Card, 3rd Prize: $3,000 Gift Card, 4th & 5th Prizes: $2,000 Gift Cards, 6th-10th Prizes: $1,000 Gift cards, 11th-200th Prizes: $200 Gift Cards. yourtown Prize Home Draw # 486. 380,000 tickets @ $15 each. 1/174 Pacific Parade, Bilinga (Gold Coast), Queensland 4225 including $350,000 Gold Bullion and $25,000 Flight Centre Voucher. 2nd Prize: $10,000 Travel/Shopping Vouchers. 3rd Prize: $5,000 Travel/Shoppers Vouchers. Endeavour Foundation Star Supporter Mini Countryman Lottery. Tickets free for Star Supporters. 1st Prize: Become a Star Supporter by May 29 2019 to be in running to win a MINI Countryman valued at $60,426. 7 x Early Bird Cash Draws. 4 x Exclusive Luxury Car Draws. 1 x $10,000 Christmas Cash Draw. 210,000 tickets @ $100 each. 1st Prize: 4 Stanley Street, Glenelg North, South Australia including $1,000,000 Cash. Total 1st Prize Value $3,000,000. Early Bird Draw: Buy tickets before 10.5.19 and you could win a 2019 Mercedes-Benz AMG GT C or take $350,000 Cash. Drawn 21.5.19. Bonus Draws: Buy tickets before 18.4.19 and you could be one of six lucky winners of a Land Rover Discovery Sport. Drawn 2.5.19. Incorporating Cash Calendar and Holiday for Life Lotteries. Endeavour Foundation Prize Home Lottery # 421. 1st Prize: 205 Western Avenue, Montville, Queensland 4560, Sunshine Coast Hinterland, valued at $1.3 million. 1st Prize: Toyota Land Cruiser Prado $75,194. 2nd Prize: Around The World in 20 Days - London, Paris, New York, Waikiki $35,000. 3rd Prize: Toyota Corolla $24,424. 4th Prize: Uluru Holiday $6,000. Plus - One year supply of groceries - $5,200 Coles Gift Cards - 3 to be won. 1st Prize: Mini Cooper $36,655 or $36,665 Gold. 2nd Prize: $4,000 Flight Centre Travel Voucher. MS SA & NT Cash Bonanza Lottery. VIP Prizes: $3,000 Cash & $2,000 Cash. Animal Welfare League South Australia Wish Upon A Star Lottery. 74 Other Prizes To Be Won. 100,000 tickets @ $100 each. 1st Prize: $2,600,000 Porter Davis Home and Land Package or $2,600,000 Gold. Which dream Victoria suburb would you build in? Early Bird Prize: Mercedes-Benz AMG C43 $119,876. Closes 15.5.19, Drawn 17.5.19. Bonus Prizes: 20 x Dream Holiday or $10,000 Gold. 6,670 Prizes to be won. 1st Prize: 2019 Subaru Forester $41,577, or Canada Trip $40,500 or $40,000 Cash. 2nd Prize: $2,500 Travel Voucher. 3rd Prize: $500 Coles Myer Voucher. Tickets start 4 @ $20. 1st Prize: Mini 3-Door Hatch plus $34,000 Gold Bullion = $74,424. 2nd Prize: Sporty 86 GTS Coupe 2.0L Auto $43,412. 3rd Prize: 16 Day European Adventure $35,000. 4th Prize: Great Barrier Reef Experience $16,000. 5th Prize: Shop 'Till You Drop at Harvey Norman $10,000. 6th Prize: Pet Supporter Club Prize - Toyota Yaris Ascent $20,677. Bobus Draw: But $80 or more tickets for chance to win $4,000 Gold. 1st Prize: Brand new Hyundai Accent Sport rrp $20,882 or one of four amazing trips - Nepal, Bhutan, or Winners Choice valued at $20,900. Horses for Harmony Foundation Limited. 700,000 tickets @ $10 each. 1st Prize: 1959 Chev Corvette valued at $150,000 plus on road costs, car spa package, delivery allowance - total prize package $174,175. Bonus Prize: Purchase 5 or more tickets and be eligible for $10,000 worth of silver coins. Kids With Cancer Lottery # 69. 1st Prize: $100,000 Choose between Cars, Boats, Holidays, Bikes & Caravans.